Prepared by text co-author Roger LeRoy Miller and William Eric Hollowell, this comprehensive study tool provides chapter-by-chapter reviews that include a brief chapter introduction, chapter outline, true-false questions, fill-in-the-blank questions, multiple-choice questions, short essay problems, and Issue Spotters. 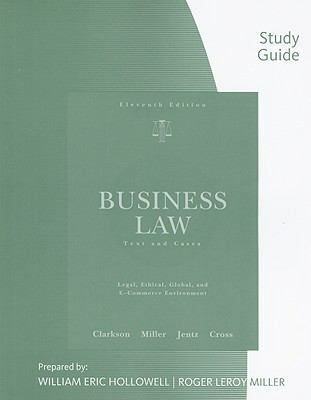 The answers to the questions and Issue Spotters are found in a separate appendix at the end of the Study Guide.Miller, Toby is the author of 'West's Business Law Study Guide', published 2008 under ISBN 9780324655254 and ISBN 0324655258. Loading marketplace prices 25 copies from $3.48 How does the rental process work?